FRESH NEUTRAL PAINT thruout some of the home--LOOKS GREAT!! Stylish home w/a lvl, fully fncd bckyrd! Oversized inviting foyer opens up into an entertainers dream lrg LR/den w/vltd ceiling, surr. sound, gaslog FP, & hrdwd flrs. A wide opening leads into the eat in kit boasting lots of cabs, brkfst bar, & dining area w/frnch dr (dr on rt to be replaced w/org dr so they match) access to private back deck (gas grill to remain). Off the kit is a nice size lndry/mud rm & steps to the finished bonus rm w/surround snd. Spacious master BR incls updated hardwd floors, walk-in closet & a private en-suite bath (jetted tub & sep shower). 2 additional BR's and a hall bath. Tile in kitchen, bths & lndry rm. Cute storage shed in bkyrd (no power) for tools & lawn equipment. 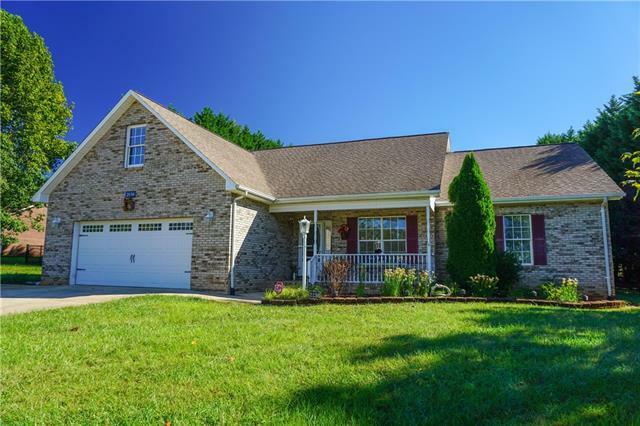 Nicely landscaped w/privacy trees in back, cvrd rocking chair front porch, double garage w/bonus rm above. Security System & updated garage door. Located on a 0.53 Acre lot. This cute home will not last long! *Gas Dryer Hookup only.